Tropical tiki bar with a menu of classic tiki cocktails, a selection of sharing drinks, individual tipples and tiki-style shooters. We know what you’re thinking. How many tiki bars does one city need? 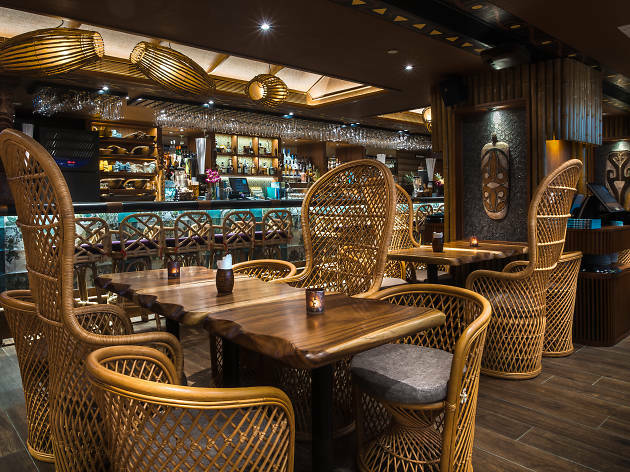 Surely the space has been monopolised by sister venues Honi Honi and Mahalo, both recognised with places in last year’s inaugural list of Asia’s 50 Best Bars. It’s all too easy then to make comparisons to these industry titans with Wyndham Street newbie Wahtiki. 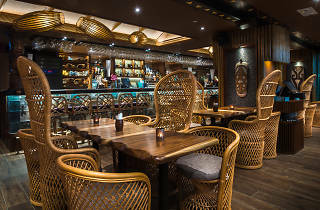 Upon entering this large third floor space though, it’s immediately apparent that if Wahtiki has taken any cues from Hong Kong’s tiki masters, it’s in theme only. Where the others are half-club/half-bar, Wahtiki is strictly the latter, with low, wood-topped tables, and wicker seating dominating the room. These features are complemented by a retro-style wallpaper and feature walls lined with foliage, as well as lesser-known classics of old-school reggae playing over the speakers. Atmospherically, Wahtiki ticks all the boxes with what looks like ease. Naturally, the menu also follows tiki suit, with a selection of sharing drinks, individual tipples and tiki-style shooters. We begin with a Wahtiki Own Punch ($140), which uses fine light and dark rum with fresh fruit and given a touch of toastiness with the addition of almond. Served in a porcelain tiki head, it packs a punch but is lacking a little in depth. Likewise the impressive looking Shark’s Tooth ($160). Presented in a highball glass surrounded with a mountain of crushed ice, the combination of over-proof rum with fruit juice looks impressive, has a definite kick, but doesn’t fully explore its layers as much as it probably should, though it is very easily drinkable. The fact that the actual ingredients aren’t listed on the menu, either, also makes it that much more difficult to know what’s going on. The bar snacks are solid though, an impressively detailed list that includes well seasoned fried squid legs ($80) and a tender beef and fried basil kabob ($90). We only wish as much care was taken with the drinks list. But with friendly service and an awesome vibe, this is one island getaway we see becoming a bit of a regular. Mon - Wed 5.30pm - 1am, Thur 5.30pm - 1.30am, Fri - Sat 5.30pm - 2am.